In November of 1972, I sat on the concrete stoop, or rather, the pad that passed as a porch on our little house in Belton, Texas, and I mourned as monarch butterflies filled the sun-filled air in front of me. They were leaving for the winter; I was simply leaving. I could feel tears wet on my face. Behind me, the house was filled with boxes and furniture ready for the moving van that would come the next day. I’d left the white cord macrame curtain I’d tied in the wide front window. My gift to the house. We, my sons and I, were moving to Germany to join my solder husband. The three years in Belton had filled themselves “to the brim” if one could say years could be filled like coffee cups. They had certainly been full. We’d moved from our first dark and cramped house to this one, filled with windows and light and while small, a happy house. People say I do too much now, but ya shoulda known me then. We built a big vegetable garden across the street in an empty lot; bought fresh milk and meat from a woman in the country; I churned our butter and baked all our bread; and in the meantime, worked in the women’s movement and politics and started college and had a job in art therapy and raised the sons. I sat, watching the butterflies, seeing my life as constant movement, wondering how I’d ever make sense of it all. Doris Lessing’s The Golden Notebook lay open in my lap. I’d already read The Four-Gated City; Martha Quest, the lead character who was always wandering, was as familiar to me as my own skin. I don’t remember the character names in The Golden Notebook although the book still sits on my bookshelf along with several of her other books; but I remember the vision of notebooks. On that day, with butterflies and tears in my eyes, I decided to begin keeping a journal. Writing about sitting on that porch with butterflies filling the air and grief in my heart was the first post in the first notebook from over forty years ago. Now, there are shelves and shelves of notebooks. 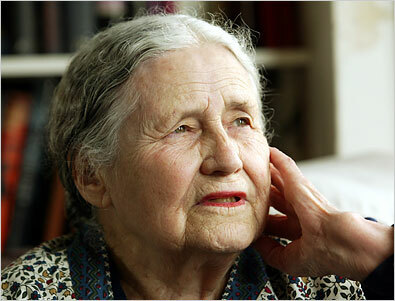 And I remember Doris Lessing. And feeling her death brings up another grief, one, perhaps, as much for myself. Life, for humans and for butterflies, is so short regardless of how much you manage to press into it and how many years you live. She was ninety-four. I’m almost seventy. It’s a weird thing to be almost seventy and I keep reminding myself of the fact. Which doesn’t change, as Lessing was well aware. Regardless of what she wrote and the many books she published, she was the real character. As, I suppose, I am in my writing. But not having her ahead of me is a little scary. Or, perhaps, just empty. Thanks for the ping! And PS: if you’re writing (even after a lag of twenty some days) you’re a writer. At least I think that’s how it works! All the best. I know we really don’t need any more reasons to meet in person…we know the universe wants it….but now we have Doris Lessing too? I was so sad to hear of her passing. The Golden Notebook had a huge impact on me in my early 20s. I think I need to re-read it. Thank you for writing this. It’s just beautiful. Re-reading The Golden Notebook may, indeed, give you the comfort/courage/insights you need at this time. Interesting, isn’t it, how old books feel like old friends. And by this time, we’re more or less old friends! Thanks so much for reading and for your kind words. Oh, yea! Thanks for seeing the curtain. I can still see it after all these years, too. And yes, other than her professing to be a communist and atheist, Lessing and Day are very much alike. Thanks for your kind words and for reading the blog. I’m delighted to have you aboard! Thanks so much for the ping back. Nice site you have! Now there’s a laugh out loud for my morning! Thanks, Sheila.